Both Omani Boats Competing In The iShares Cup Get Off To Strong Starts With Wins On First Day. The picturesque setting of Venice's canals has proven to be a welcome sight for both of the Extreme 40 catamarans sailing for Oman. Masirah, Oman Sail's boat that competed last year and finished the circuit in third overall continued her winning ways by finishing the last two races of the day with back to back victories. 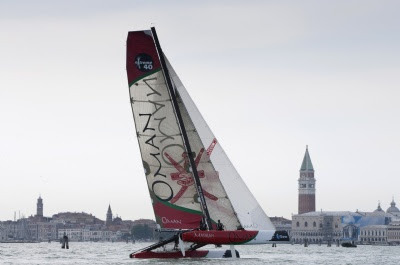 Renaissance, Oman Sail's second boat for this year's competition, scored a victory in the second race of Friday's five races. A slow start to the day means that M asirah holds third place for the day and Renaissance in fifth but in a strong position for Saturday and Sunday's racing. One of the Omani crew members racing on the Extreme 40's in the iShares Cup, Mubarak Al Battashi was very happy with the first day of competition, 'We put in a lot of work over the winter in Muscat to make sure that we were a strong team from the first race. Winning two out of five races against some of these teams is a great result and we hope to improve on as the weekend progresses'.